2 Bedroom 2 Bathroom Villa with internet and UK TV. The Villa is close to all amenities, a mere 5 minute walk to the nearest supermarket & town centre, restaurants & bars. Polis gardens is a flagship complex. It is maintained to a very high standard by the management company & residents. There are a large number of sunbeds/parasols surrounding the excellently proportioned swimming pool. Fabulous mountainous backdrop. 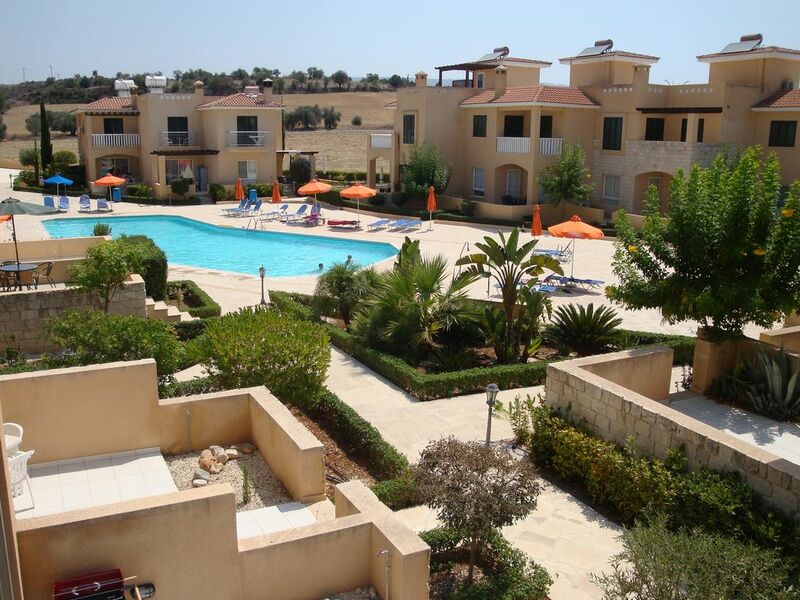 Polis Gardens is the perfect holiday for Families and couples. This house offers everything you will need for a comfortable stay, The communal pool is perfect and has sun beds and parasols for your use. This house offers internet use and Uk Tv. It's a short walk in the town square where you will find a large selection of restaurants and shops. The large pool is 1.40m deep and is set in lovely gardens with excellent views all around. En-suite walk-in shower room to bedroom 1 and bath with over head shower to bedroom 2. There is also a wash room down stairs with toilet and sink. The use of heating will be an extra fee. The lounge area has 2 sofas a coffee table a large flat screen TV and small tables for side lamps. It also offer's a 4 seater dinning table for indoor dinning. The kitchen is fully equipped for all your needs including. Cooker, Washing machine, Dish washer,Fridge freezer, Microwave Toaster etc. The closest course is the challenging Tsada Golf Club (approx 40 Minutes Drive) established in 1994, the first course designed by Donald Steel. Par 72 - 6,855 yards and located amongst vineyards, next to a 12th century monastery it is bathed in cooling sea breezes in the summer season. New club house currently under construction. Approximately 55 minutes drive away, you will find the Secret Valley Golf Club (Par 72 - 6,737 yards) a championship course surrounded by stunning rock formations and mature trees. Nearby is the Aphrodite Hills Golf Club (Par 71 - 6,855 yards) championship course designed by Cabell Robinson built on two plateaux which has spectacular views of the sea. Notes on accommodation: The house has internet, fly screens to all windows and patio doors, it also has shutters to help keep the property cool in Summer. We can also arrange baby equipment if needed. Outside: Set in the lovely village of Polis, the house occupies an enviable position in a tranquil setting adjacent to open countryside yet just a minute or two's stroll into the village. Watch the stunning sunsets whilst relaxing on the sun terrace surrounded by landscaped gardens. A large shared swimming pool. A separate outdoor dining terrace provides for the full al-fresco experience. The house is a mere 10 metres from the stunning pool but does not suffer from excessive noise. Cleaning / Towels / Linen / Maid service: The house will be cleaned for your arrival with enough bath/hand towels, the beds will be made up and a welcome ptk to get you started. We can offer mid-stay linen changes for a small charge. This was the first time on Polis Gardens. Very neat and tidy. Accomodation was pristine and quiet. Kim was great, very easy to get in touch with her and she was very helpful indeed. Overall excellent and will return. Kim was a brilliant host and went above and beyond with any additional requests me made. We arrived on a late flight and the welcome pack provided was more then adequate for breakfast in the morning for the 4 of us before going to the supermarket. The house was very clean and has lots of personal touches making it feel like a home from home. The tv has English channels which pleased my Elderly aunt as she was able to watch her soaps. The town centre is a 10 minute walk away and the beach another 15 minutes walk although I would recommend using the car as it is all up hill coming home in the heat. We would definitely return to Polis and stay at Kim’s house again. Excellent .Will go back again and again. Really enjoyed stay beautiful town house just off pool area ,easy to reach town .Nice location would say car is an advantage.Kim very helpful and always available. Your positive comments will be very helpful for other guests who are looking for something like this. Thank you very much for taking the time to comment and I'm very happy to welcome you and your family any time in the future. Thank you for taking the time to write this positive review. I would like to wish you all the very best in your new life here in Cyprus. Fantastic house with everything you could need. The house had everything you could need. Despite some very hot weather for the time of year, the ceiling fans & fly screens were perfect to keep cool at night & did not need to even think about using the AC. Having the washing machine & dishwasher was very handy & next time we use the house we can consider less changes of clothes & therefore lighter luggage. The pool is very well maintained & fantastic to have cool off in & relax beside.The the whole complex is well looked after & all residents very welcoming.This house is well positioned & you can walk into the town square to visit your favourite bars & restaurants within 15 to 20 minutes.It is also positioned close to several shops & the main supermarket, easily walkable. Sattelite TV has all English channels, the easiest to use I have ever encountered in a rental property & easy to use DVD player. We will be using this property again. I'm so pleased you enjoyed your stay in the house and I would like to thank you for your positive comments. It was a pleasure to meet you. Wonderful clean and well equipped villa with beautiful swimming pool.The garden well maintained and beautiful to look at. Very good location to explore that end of island. Wonderful restaurants to choose from . Polis beach is only 15 minutes walk from the house. Well known location for the summer sunsets where the enormous, glowing sun disappears into the sea within minutes of dropping from the sky. Polis Bay itself is stunning with the Akamas Peninsula and Baths of Aphrodite to the West of the house, approx 5 minutes drive away. Pomos Point and harbour to the East is approx 20 minutes drive away. All set with the backdrop of Paphos Forest and mountains. Paphos Airport 45 mins. Car hire or taxi from airport. Car hire not necessary at Polis Gardens though would need to walk for shopping etc. A brand new large supermarket has now opened in Polis, about 3 min walk away. Driving in Cyprus is the same as in the UK (on the left). There is also a quite amazing public bus service which enables travel to anywhere in the Paphos. Buses run around every hour. Polis village 5 min walk away. Paphos Town approx 35km. Latchi Marina approx 2km. Polis is situated 35km North of Paphos on the Western side of the island of Cyprus close to the Akamas Peninsula and Aphrodite's pool. The area is truly breath-taking with an excellent climate, beautiful scenery and un-spoilt beaches. Many Cypriots chose to relax here and have their holiday homes in this area. Polis is a 45 minute drive from Paphos airport, directions will be provided with your confirmation. Rental cars can be hired from the airport either ahead of travel or upon arrival, or we can arrange for a return taxi service for you (for daytime flights only) for around £80. Car hire is also available in Polis. Our holiday home is located in the countryside on the outskirts of Polis, which is a small town located on Chrysochous Bay, boasting sparkling turquoise-blue waters and bordering the beautiful Akamas Peninsula Nature Reserve/National Park. It sits amongst a small number of low-level houses and apartments in beautifully landscaped grounds, surrounding a large shared swimming pool with lovely views all round of fields and hills and is a lovely place to relax. Local shops are a stones-throw away offering a good selection of the basics and a really good supermarket is just 5 minutes away offering wide variety of local & international produce. The location is an ideal base for exploring the local area by foot or bicycle; motorbike, Quad-bike, car or Jeep, all of which are available to hire in Polis. You can go hiking, mountain biking, exploring, horse riding, golfing, enjoy and variety of water sports and in the winter you can even go skiing in the nearby Troodos Mountains; or you could simply enjoy the peace and quiet and relax in the sunshine. Polis town is just a 10 minute walk from the house. It is a lovely traditional town centered around a cobbled square and boasts many good bars and restaurants offering a variety of quality food, freshly caught fish is a speciality. Live music is on offer during the summer months of July, August and September. Booking Notes: Once you have excepted the rental cost a GBP100.00 deposit will confirm your booking. You will then need to make the full balance payment 8 weeks before arrival. We also require a GBP100.00 refundable bond to cover any breakages. Changeover Day: Departure times will all depend on whether there is another booking on the same day. Times can be flexible.